The Wharfedale General Hospital Cardiac Club was formed in 1991 by Dr. K.E. Birkin, a former consultant at the Wharfedale Hospital, together with a small group of cardiac patients who were keen to continue exercising after completing the Hospital rehab course. They wanted to continue with their regular exercise routines and were encouraged by hospital staff and offered accommodation in the physiotherapy unit at the Wharfedale Hospital to set up and run their own group. Initially there was only a handful of active members and by 1994 about a dozen attended the once weekly session. Hospital staff also came along, so there was always at least one staff member present. 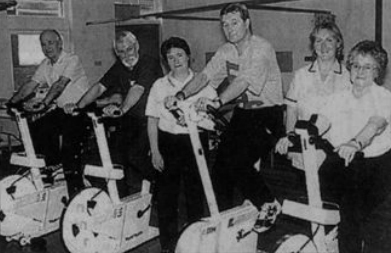 The photo below, taken from a press cutting, shows an exercise class during the early days of the Club in the 1990s. In the years since then, numbers have grown steadily, with patients being referred by local G.P.’s, cardiac consultants and through the Phase 3 cardiac rehabilitation programme. In due course, professionally qualified exercise instructors were engaged to lead and supervise the exercise sessions. The Club has a comprehensive set of procedures to ensure smooth running. A redacted version (i.e. with any sensitive information removed) is available to download as a PDF Manual ​. Over the years, the Club has made donations to the Wharfedale Hospital. 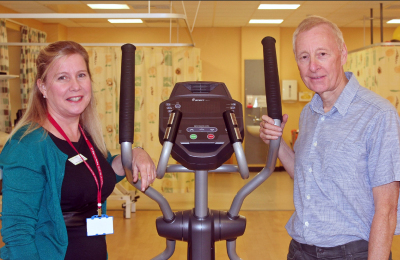 For example, in 2016, the Club donated new, professional standard exercise equipment to the value of almost £6,000 to the Physiotherapy Unit at the hospital (the photo below shows the Chairman, David Farrow, with the Hospital's Head of Nursing, Zoe Kirk on presentation of the new equipment).